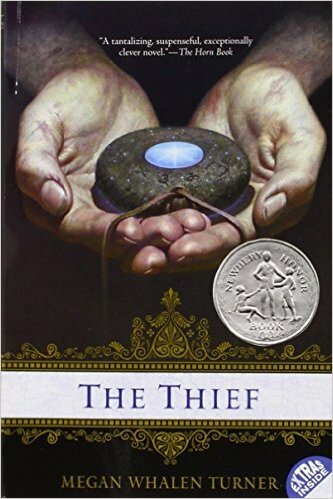 Ages ago–maybe two or three years ago–Anna sent me a Kindle book called The Thief, by Megan Whalen Turner, as a gift. She told me it was YA fantasy/adventure book that she really liked and she thought I would like too. And I read it and I thought it was fun and and well written and had an interesting twist at the end, and I moved on with my life and didn’t think about it again. Then a few weeks ago I was on vacation, sitting on the beach, and when I finished my trashy romance novel I didn’t feel like walking back the beach house to get another book. So I started poking around my Kindle, looking for something else to occupy me until I was willing to leave the beach, and The Thief popped up. 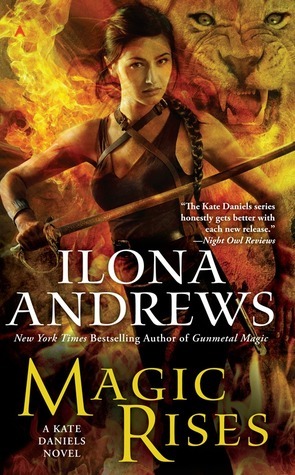 I started re-reading it and was reminded of how much I enjoyed it and then a tiny voice emerged from somewhere in the depths of my memory: could there be . . did Anna say . . is there a sequel? You guys, there wasn’t just one sequel, there were THREE, and apparently two more books on the way. And as much as I liked The Thief, the two books that came after it were so so good that I am now completely obsessed and desperately waiting for number 4 to come in at the library. So The Thief is about a thief (yes) named Gen who we first meet in the king’s prison after he was caught stealing something audacious and then bragging about it in the pubs. Enter the king’s magus, who offers to get Gen out of prison if he will use his considerable thieving skills to steal something important for the king. The thief, the magus, and the other folks in their little party then ride around dodging soldiers, looking for this mysterious object, and trying not get killed by any of their enemies. The actual thing they’re trying to steal was a bit of a MacGuffin for me, but Gen is a smart, tricky character, and up until the last minute it’s never quite clear who’s using who and how much Gen is controlling the situation. It’s suspenseful with a dark edge (there are deaths along the way and prison is not sugar-coated), but Gen himself is very entertaining. It’s the second and third books that take the action to a whole new level with intrigue and awesome characters and complexity. However, it’s challenging to talk about these, because you can’t even describe the most basic plot elements of any books past the first without ruining the fun of the first book. So I’m not going to say a word about what happens in the rest of this series–I’m not even going to write out the titles. You’re just going to have to trust me when I say that books get twistier and darker and better. This is like when I owned paperback copies of the Philip Pullman’s Sally Lockhart books, a YA Victorian mystery trilogy he wrote before his famous His Dark Materials trilogy. They’re great books that I was constantly loaning to people, but reading even the first line of the description on the back of the second book just about ruined the first one, so I taped post-it notes over the back of the books so that I could hand someone the whole stack with spoiling them on the plot before the were ready. So consider this review a virtual stack of books with post-its taped on the back. I love these books. The third one is my favorite, but these are quick reads and fit nicely together as one whole story. I should have listened more carefully to Anna when she initially told me about these, since she’s always right these things. Don’t make my mistake! Kinsey’s Three Word Review: Dark, complicated adventures. You might also like: The Phillip Pullman books that I mentioned, actually, as well as a number of things that we’ve already raved about here: the Graceling books by Kristen Cashore, The Girl of Fire and Thorns trilogy by Rae Carson, and the His Fair Assassin trilogy by Robin LaFevers (the killer nun books). You might also like Cinda Williams Chima’s series that starts with The Warrior Heir, a fantasy YA story that did a number of interesting things and that hasn’t gotten nearly the attention it deserves–it’s the better version of the Mortal Instruments series.